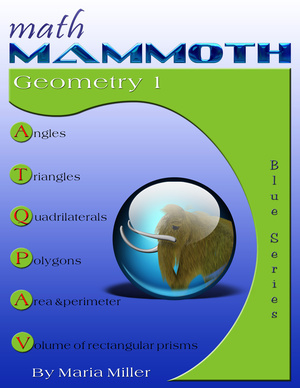 This 4th grade geometry lesson explains angle measure, how to measure angles with a protractor, and has varied exercises for the students. The video below explains what an angle measure is, how to measure angles with a protractor, and how to draw angles with a protractor. Remember how one side of the angle traces out a circular arc? We use that circle to measure how big the angle is. We look at how much the angle has “opened” as compared to the full circle. Angles are measured in degrees. The symbol for degrees is a little circle °. The FULL CIRCLE is 360° (360 degrees). A half circle or a straight angle is 180°. A quarter circle or a right angle is 90°. Show the angles below using two pencils. Try to “see” the circle that is traced out in the air. This is a 1-degree angle! Place the midpoint of the protractor on the VERTEX of the angle. Line up one side of the angle with the zero line of the protractor (where you see the number 0). Read the degrees where the other side crosses the number scale. Take care to read from the right set of numbers. A protractor has two sets of numbers: one set goes from 0 to 180, the other set from 180 to 0. Which one you read depends on how you place the protractor: place it so that one side of the angle lines up with one of the zeros, and read that set of numbers. In the examples above we lined up the one side of the angle with the zero of the lower set of numbers, so we need to read the lower set of numbers. 2. Measure the angles. Label each angle as acute or obtuse. that she had read the wrong set of numbers on the protractor. What is the correct angle measure for the angle she measured? 6. Draw four dots, and connect them so that you get a quadrilateral. Measure all the angles of your quadrilateral. Then add the angle measures. Did you get 360 degrees, or close?